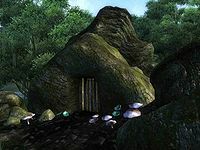 Reedstand Cave is a medium-sized cave between Bravil and Leyawiin containing monsters. It contains two zones: Reedstand Cave and Reedstand Canyon. This cave contains 16 Cairn Bolete plants and 15 Wisp Stalk plants. This location's map marker (M on map) is named Reedstand Cave (editor name ReedstandCaveMapMarker). The entrance door is SSE of the marker, 30 feet away. Reedstand Cave is a typical monster cave, linear in structure and easy to navigate, and a decent amount of available treasure makes exploring it worthwhile. Upon entering from door Out, enter the first room, fight or sneak past two or three enemies and unlock the chest. 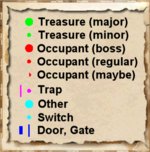 Proceed through the southeastern tunnel to another room and make a choice; either go directly for the boss chest in the next zone by following the northeastern entrance to door C or continue south and explore the rest of the area. Continuing south will net you an encounter with a dead bandit lying next to an unlocked chest and two remaining chambers to investigate from the intersection. Finally backtrack to the second room and locate door C, leading to Reedstand Canyon. 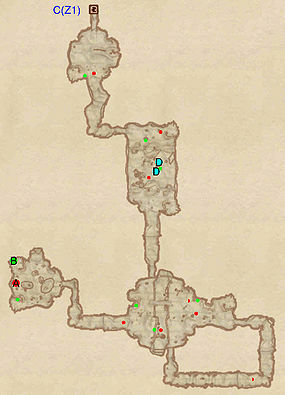 This zone is even more linear than Reedstand Cave and contains a minimum of enemies, making the trek to the boss chest an easy one; locate the chest in the first room, then head south until you land in a large room with two dead bandits at D, a few enemies and two chests, one of them locked. Keep going south and emerge in an underground tunnel dividing two ledges above. Follow the path in a counter-clockwise direction until you emerge on the upper level. Two chests with minor loot sits on each of the ledges, both connected by a narrow bridge. Take the eastern tunnel to the final room and face the boss-leveled monster at A and claim your reward from the boss chest at B. There is no shortcut back to the previous zone, so backtrack all the way back to door C and reenter Reedstand Cave.